As your pregnancy progresses, you’ll start to notice your stomach rapidly beginning to expand, beginning midway through the second trimester. Not only can a growing belly make it hard to walk or balance, but it can also make it impossible to sleep comfortably. Pregnant women must sleep on their sides starting during the second trimester. Without proper support, a woman will experience pain in her neck, lower back, and hips. During pregnancy, sleep is essential for both the health of the mother and the growing infant. A maternity pillow can make a world of difference when it comes to how well you sleep at night, especially when you’re nearing your due date. The best pregnancy pillow is soft, firm, comfortable and can help to support your growing belly while providing much-needed hip and back support. The Leachco Snoogle body pillow is the best pregnancy pillow on the market that provides stomach, neck, hips, and back support. The pillow measures in at sixty inches long so it can easily wrap around your growing belly. The pillow was designed by a registered nurse and parent who truly understands the comfort needs of expecting mothers. The pillow’s horseshoe shape supports the stomach, hips, neck, and back. Placing the pillow between the knees, under the belly and neck promotes proper spine alignment. This type of extra support works to ease back and hip pain. This pillow isn’t just for pregnant women, in fact, it’s a good choice for anyone in need of added neck and back support during sleep. The pillow works to perfectly contour to the body, providing ultimate support where it’s needed most, unlike a traditional pillow that’s flat and straight. The curve of the pillow is the perfect place to rest your head and neck in a more comfortable, yet supported position. The pillow’s long midsection is ideal for belly and back support. The tail of the pillow will curve back to fit between the legs, which works to support the hips. The pillow’s removable cover is made from a cotton and polyester blend and is machine washable. The cover is gentle against the skin and soft to the touch. The zipper on the cover is heavy-duty and makes taking the cover off or putting it on fast and easy. The covers are available in six different colors including mauve, sage, ivory, khaki, brown, and gray. Keep in mind that the price of the pillow will vary depending on the color you choose. This extra-thick pillow won’t flatten out over time or with heavy use. Pros: This body pillow can also help people who are suffering from muscle issues, back problems, sciatica, pelvic, hip, and joint pain, leg pain, and muscle spasms. Sciatica is common during pregnancy and it occurs when the sciatic nerve is pinched. This results in pain radiating from the lower back, down the buttocks to the leg. By placing the tail of the pillow between the legs you’ll be able to adjust the lower spine, so it’s in the correct aligned position. This will take the pressure off the sciatic nerve and minimize or stop the pain. This pillow helps to relieve muscle spasms by allowing you to lay in a position that doesn’t restrict blood flow to the affected areas. Improved blood flow will increase oxygen to the affected parts of the body. Expectant mothers have to deal with a whole host of physical problems the larger their baby grows. This maternity pillow will allow you to lay comfortably on your side, reducing the strain the weight of the baby places on your back. You can align your spine to reduce pain and tension in the legs, back, and hips, allowing you to finally sleep comfortably. If you’re suffering from one of the above health issues, then you can benefit from consistently using this pregnancy pillow. This pillow provides better support to different areas of the body for improved spinal alignment. The thick, durable pillow gently contours around the body for a close, supportive fit. 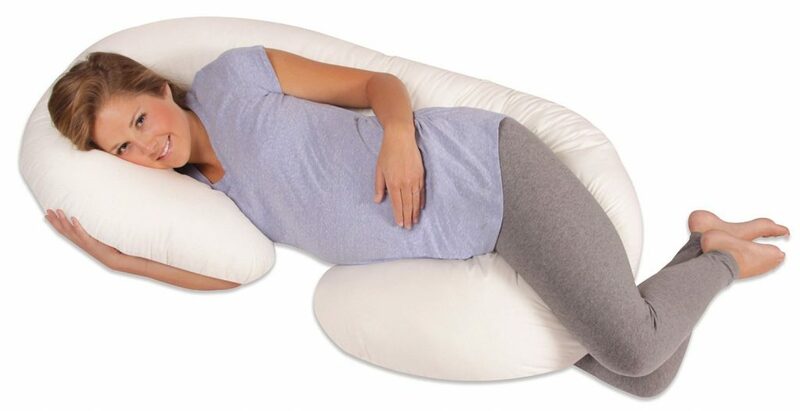 If you’re pregnant, this pillow can be a total game changer. During the last trimester, sleeping comfortably can seem almost impossible as the baby becomes larger and makes it difficult to find a more comfortable position. This pillow is very thick and fluffy and really does feel like it’s hugging your body. Not only can you use this pillow during pregnancy to help treat natural aches and pains and provide much-needed support to the back and belly, but it can also be used with newborns. Quick Tip: Once the baby is born you can place your infant on the pillow, with the pillow on your lap, allowing you to comfortably hold your baby during a feeding. This position provides plenty of support and will prevent pain in the upper back and shoulders. Another common issue during pregnancy is hot flashes, especially during the night. If you constantly feel as though you’re overheating or you sweat excessively at night, then the Red Nomad cooling mattress protector can be the perfect addition to your new sleep situation. Cons: Some expectant mothers had complaints that over a period of a few months the pillow began to flatten out. This isn’t a common complaint but it can occur if you place this pillow in the washing machine. This total body pillow by Leachco is a much better option than sleeping with several pillows because it will contour to the body for better support. It also won’t take up as much space like standard pillows will. Overall, most expectant moms were surprised at how versatile this pillow really is. Compared to similar models on the market, this maternity pillow is reasonably priced. Consumers who purchased this pillow gave it a rating of four and a half stars out of five for versatility, removable cover, quality, and color options.